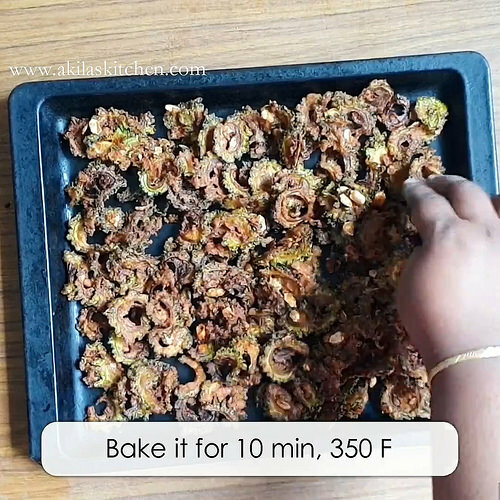 Crispy Bitter gourd chips | Pavakkai chips Ananda Bhavan Style recipe easy video and step by step instructions for your easy understanding. 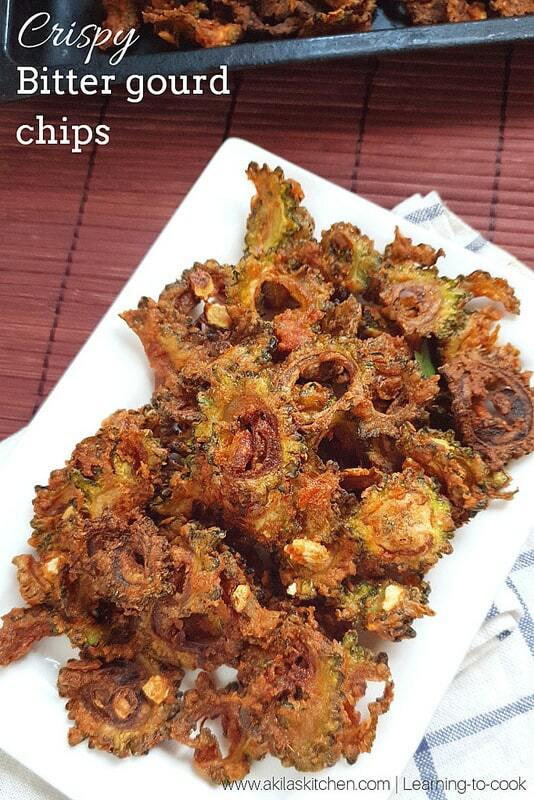 Crispy Bitter gourd chips | Pavakkai chips Ananda Bhavan Style recipe is very easy to make and the crispiness lasts for a long time. I always wondered how some chips like what we get from Ananda bhavan hotels have it’s crispiness for more days and tastes great. 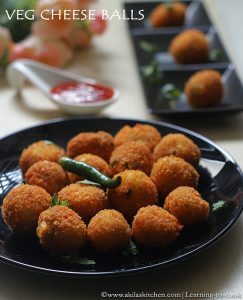 Finally I found the answer from this blog and tried the recipe which it came out really good. I have already posted bitter gourd chips recipe before with a light variation and it also tastes equally awesome. But that time I do not know how to keep its crispiness for a long time. No I got to know the secret and hereafter I do not really need to worry about that. 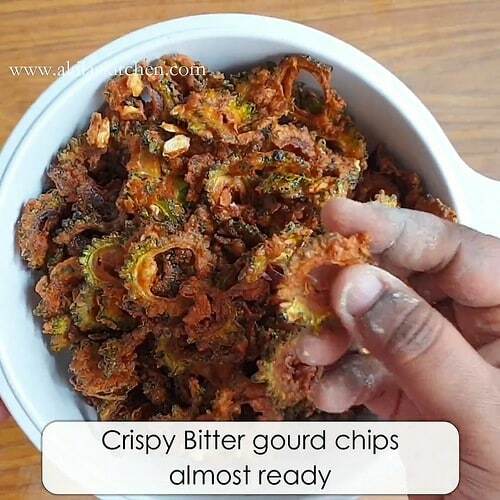 So do try this bitter gourd chips recipe and let me know how it does turned to you. 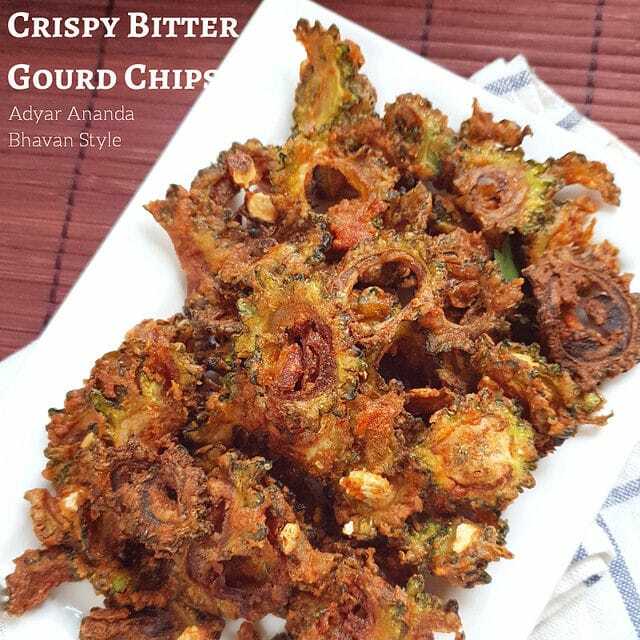 Crispy Bitter gourd chips | Pavakkai chips Ananda Bhavan Style recipe is very easy to make and the crispiness lasts for a long time. I always wondered how some chips like what we get from Ananda bhavan hotels have it's crispiness for more days and tastes great. Wash The Bitter gourd and cut the two ends of them. Let them dry out and cut them into equal sizes. 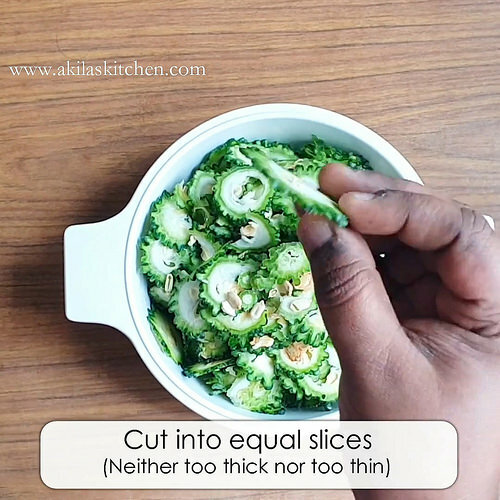 The slices of bitter gourd should neither be too thick nor too thin. 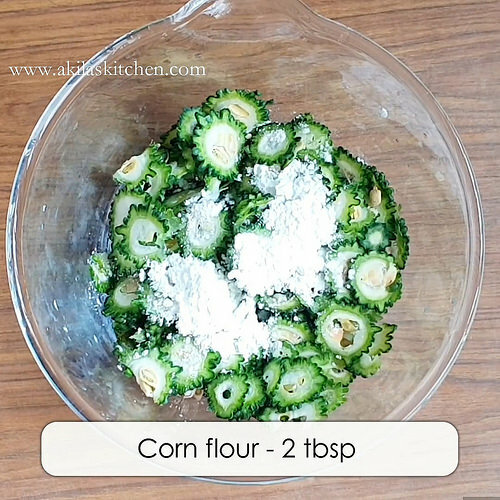 Transfer the bitter gourd to mixing bowls and add 2 tbsp of corn flour and keep the remaining 2 tbsp of cornflour which need to be used at the later stage for dusting. 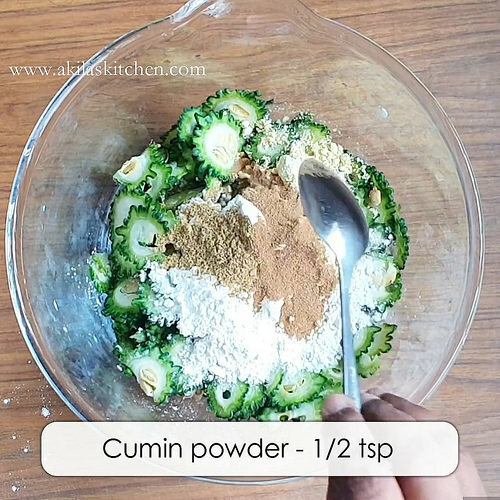 Add the two tablespoon of rice flour, gram flour, cumin powder, coriander powder, chili powder, fennel seeds powder and salt. Mix them all together nicely pouring very little water. 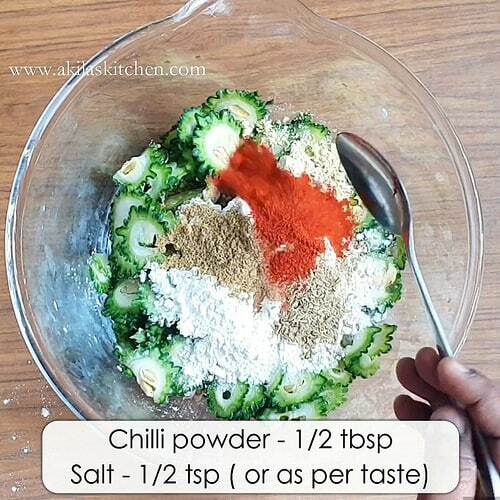 Add Only tablespoons of water at equal intervals of time and not more than 3 to 4 tbsp of water. 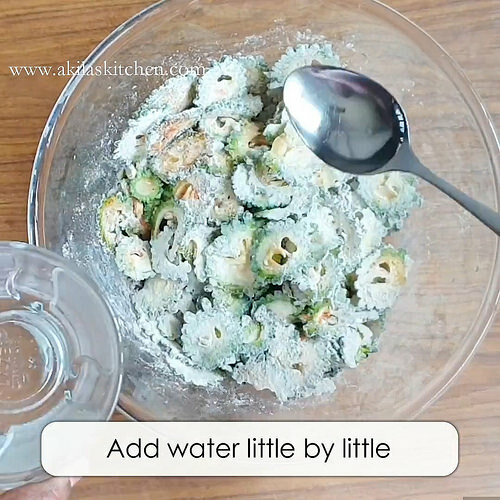 If you add more water, the the bitter gourd becomes soggy and you won't get the crispiness properly. Also you should not add the water all at once. You should add it little by little only. 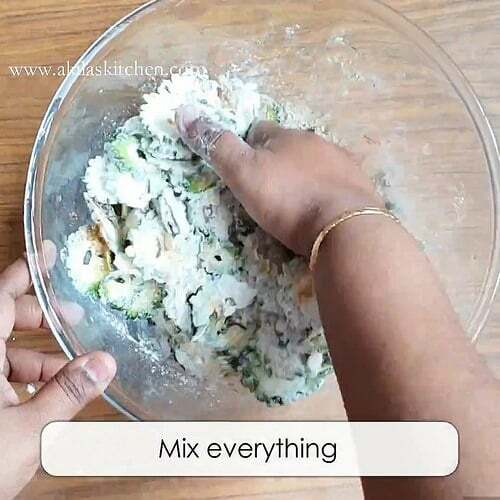 Once you have mixed all the powders and when the powders or coated well on the bitter of gourd let it rest for 15 to 20 minutes of time. 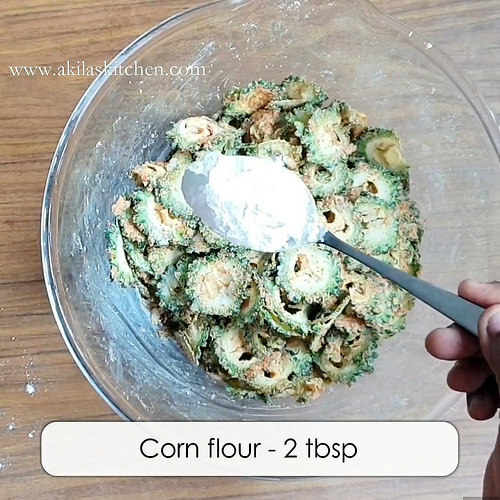 After 20 minutes add the remaining 2 tablespoons of corn flour and mix them together. Do not add any water at the stage. 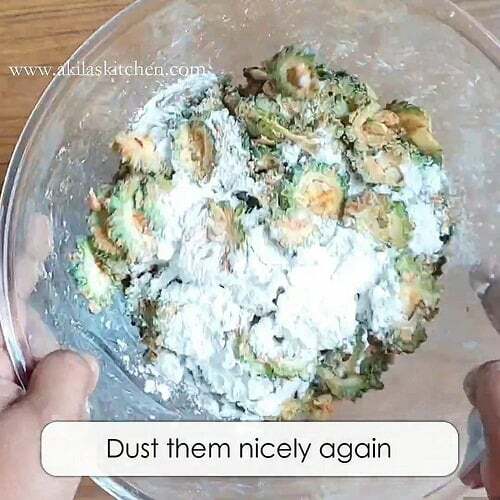 Just dust the flour and let it coat properly and evenly. Let it rest again for another 10 minutes. 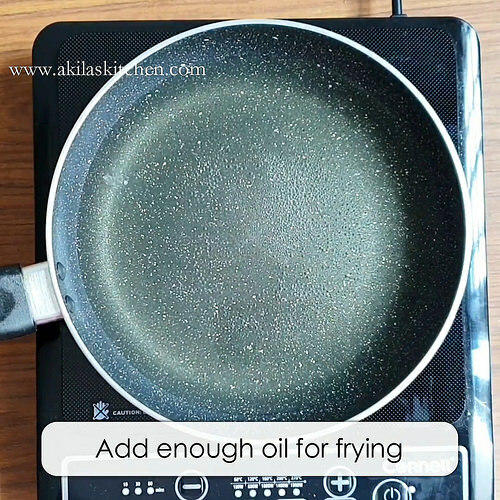 Meanwhile take a heavy bottom pan and add enough oil for frying the bitter gourd. Once the oil is hot enough and the bitter gourd little by little and in batches. 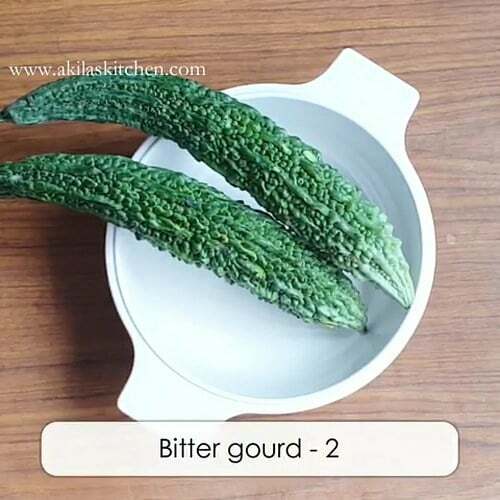 Do not add all Bitter gourd together since they may stick together and you will not get the crispiness properly. Fry them in medium Flame and fry till the ssshhhh... sound ceases. 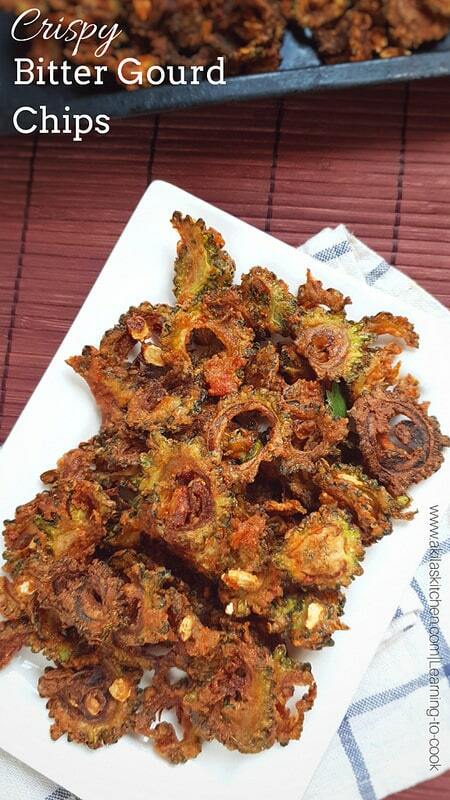 Also keep rotating the bitter gourds for even frying. 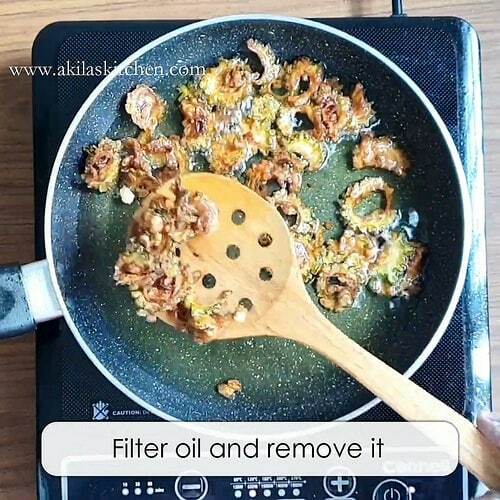 Now filter the oil and remove it. Follow the same for the other batches of of the bitter gourd. In this stage itself bitter gourd have enough crispiness. But this crispiness lasts for few day only. 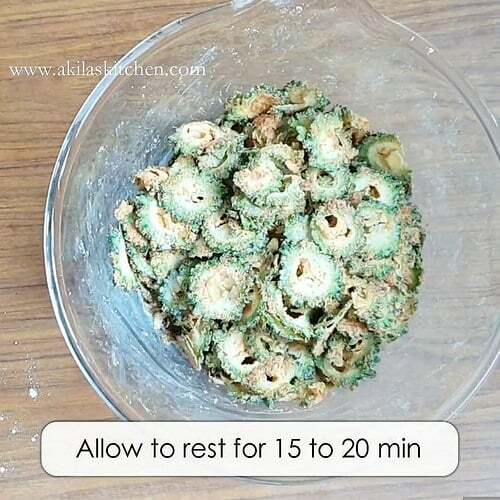 But in case if you want to store the bitter gourd for more than a week then bake them for 10 minutes at 350 Fahrenheit in a preheated oven. 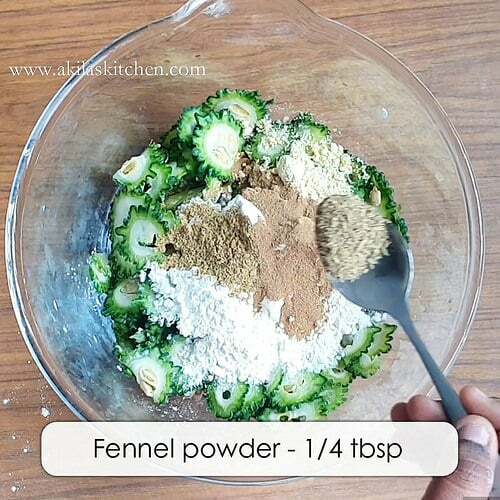 This ensures the long-lasting crispiness of the bitter gourd. If you store this chips in a air tight container you can have the crispiness for more than a week. Munch the bitter gourd chips whenever you want. Mix them all together nicely pouring very little water. 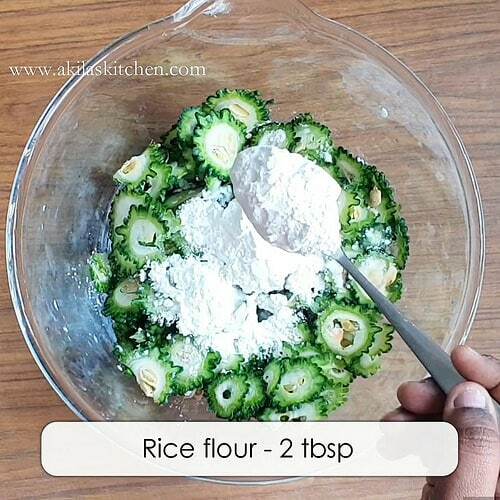 Add Only tablespoons of water at equal intervals of time and not more than 3 to 4 tbsp of water. If you add more water, the the bitter gourd becomes soggy and you won’t get the crispiness properly. Also you should not add the water all at once. You should add it little by little only. 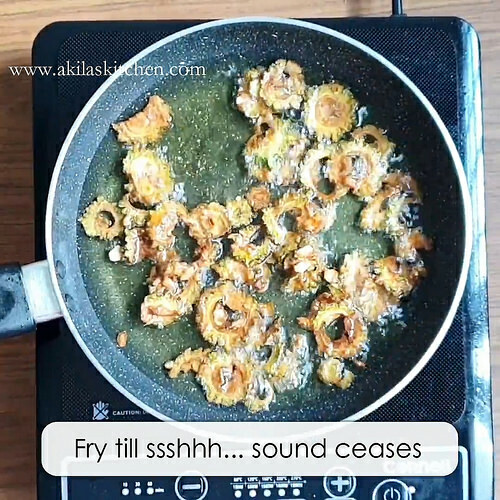 Fry them in medium Flame and fry till the ssshhhh… sound ceases. 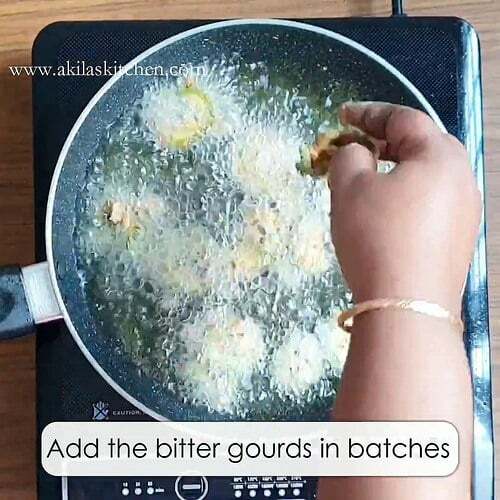 Also keep rotating the bitter gourds for even frying. Munch the bitter gourd chips whenever you want. 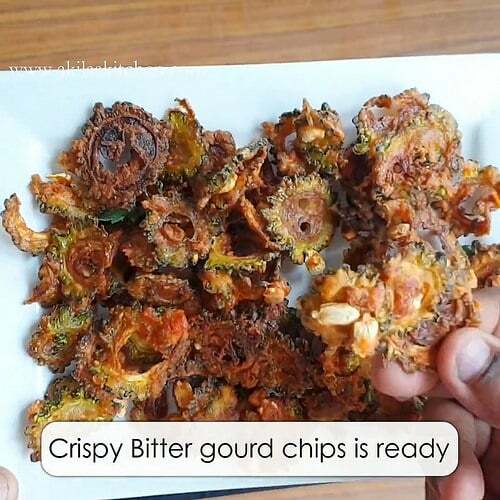 Crispy Bitter gourd chips is ready. Try tho slice the bitter gourd evenly for even frying. Do not slice them too thick or too thin. Baking at the last stage makes the bitter gourd stay crisp for a longer time. Though it is not mandatory, you can store them for longer days with the same crispiness. 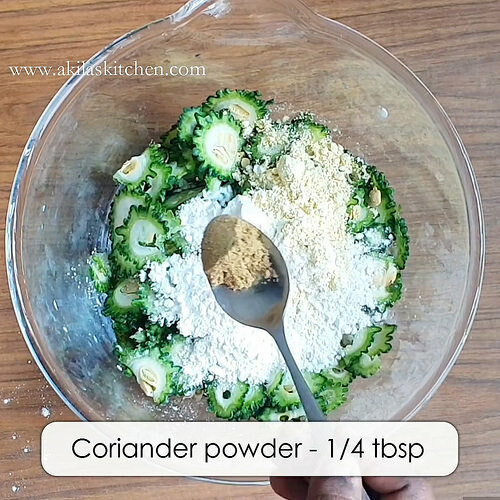 Instead of water you can add curd or buttermilk also. 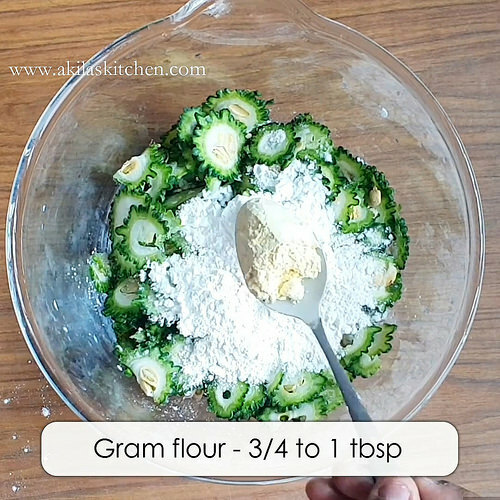 Once you have added the flours and spices, just sprinkle very little water just to bring them all together not more than that, as the bitter gourd becomes soggy and you won’t get the crispiness and also it may absorb more oil.